Will your sign encounter fun or fear this Halloween? It's no coincidence Halloween happens while the Sun is in spooky Scorpio, the time of year when the mysterious veil obscuring the otherworld lifts and opens a door to spiritual dimensions. Scorpio is ruled by Pluto, gatekeeper to the underworld, and we are fascinated by all those supernatural and hidden things lurking in the darkness -- and that includes our own dark sides! In 2011, the week leading up to Halloween also delivers a New Moon in Scorpio on October 26 that will ignite our deep, dark passions. Then the Moon moves on to danger-loving Sagittarus on October 28 to stay through the party-packed Halloween weekend, and into creepy Capricon on All Hallow's Eve October 31. We put a dark and funny twist on your real Halloween weekend horoscopes to give you the 2011 Halloween Horror-Scopes below. See what chilling fate awaits your sign this Halloween! Fearless Aries, do you suddenly feel like you're being watched? Are you paranoid?! Not so fearless anymore, are you?! 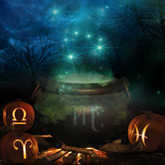 Trickster Mercury short-circuits your mental wiring Halloween weekend, and unlike the headstrong Aries we know and love, you're now shivering with fright at things going bump in the night. If you make it to Halloween night without going berserk, you still risk the horror of falling in love with some deranged monster or serial killer as your crazed Venus-square-Neptune fantasies generate a foolish desire for demons. Taurus, you gluttonous goblin -- stop gobblin' all that candy corn before you burst! Your only reason for attending Halloween parties on Saturday night is to indulge in sweets, and you're the only fiend at that party bobbing for apples just so you can have another bite. The Sagittarius Moon dares you to eat horrific amounts before Halloween night, so by October 31 you'll be hiding beneath the covers in fear of things like ghosts, goblins, calories, carbs and most of all... your scale! Mwahahahaha. Gemini twins flirt with evil all weekend, as meddlesome Mercury turns your words into daggers that threaten your nearest and dearest. Your Saturday night Halloween parties are fraught with dangerous opportunities to overreact and throw fiendish tantrums. But by Halloween night when the Moon forms mean aspects to Mars, Merc and Venus, you'll be so exhausted from the verbal attacks you'll collapse into a fit of mad, idiotic laughter until you're hauled away to some haunted asylum where you'll feel right at home. Sensitive crabs recoil from the frightful Halloween antics, so Saturday's daring Sagittarius Moon turns Cancer's caring souls into downright trolls. You'll horrify your friends by pouting and complaining about the noise and the spooks on the street, and you'll comb your neighborhood in search of black cats to rescue and cuddle in fear. By Halloween, you'll be so miffed at it all that you'll stew in silence until something provokes you, unleashing your inner demons and making your head spin 'round as though you're possessed. Eieeeeeeee! Dramatic, attention-starved Leo: You face your face your worst fear this weekend when friends don't "get" your over-the-top Halloween costume. The Sagittarius Moon dared you to take a chance, but you took it too far and offended someone -- or even worse, confused or bored them to death. Now you're lashing out for attention, which is more scary than one of those little ghost children in a B-rated horror flick. Come Halloween Night, your temper tantrums will begin to subside, but the situation is still grave as your bruised ego compels you to chase after any ol' monster who will pay you some attention. Trust. No. One. One need not fear and loathe vampires, beasties and ghosties this Halloween when we can flee in horror from hyper-critical Virgo demons instead. Your practical streak and need to over-plan puts a crimp on Saturday's Halloween parties, and your behavior is so stodgy you even horrify yourself! You retreat into a dark, private world until Halloween night, when the stern Capricorn Moon forms angry aspects to Mars, Venus and your ruler Mercury, turning your devilish attitude problem into a grand fiasco of overly dramatic Virgo proportions. 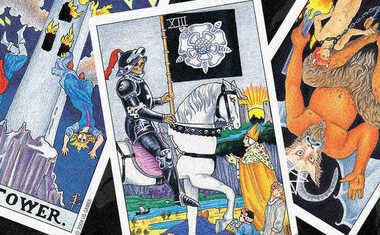 Fair Libra, you waste scary amounts of energy this weekend trying to take on more frightening fun than you can handle. Scale down your grand plans for Saturday night and prepare instead for the horror that awaits on Sunday when a trusted friend reveals your darkest secret to the world. Will you remain calm and balanced when this happens, or will you freak out and finally show your dark side this Halloween night?! You are deep and dark and haunting whether it's Halloween or not, Scorpio, but now you'll meet your monster match when others start acting even more mysterious than you. You'll be driven to madness by the secrets you uncover Halloween weekend, as Saturday's brave Sagittarius Moon prompts you to creep and spy and dig for answers. By Halloween night, harsh lunar aspects and a Venus-Neptune square will turn you into a wolfman, howling in frustration at the fact that others are not who or what they seem. How does it feel to reap what you sowed? Did someone say "Halloween party?" The Moon's in your sign on Saturday night, Sag, and you're costumed up and ready to go. Some might say you're too ready, in fact, as your zombie drinking buddies tempt you to overindulge and wake Sunday with a horrific hangover. Shake off the evils of embarrassment and get moving again, because you're in charge come fright night. Most others are out of whack today and need you to set the Trick-or-Treating pace. Bold action is expected of you. Whose house are you going to TP? Capricorn, you old stiff, you're like the walking dead this weekend, so at least you'll fit in. Wipe that lifeless expression off your face and wake up, zombie! There's a Halloween party to get to Saturday night, when the Sagittarius Moon is just right. By Sunday, the Moon shifts into your own sign, and the fun is over as others examine your mysterious moves and accuse you of foul play. By Halloween day, your mind is playing so many tricks on you that you'll wish you could drown out all the groaning and moaning by crawling back underground. You're a wild thing Halloween weekend, Aquarius! Get your werewolf on Saturday night and howl at the Sagittarius Moon, which inspires you to party hard and take no prisoners, except the ones you lock in your brain dungeon until reality sets back in Sunday. Then the intensity heightens beneath a controlling Capricorn Moon, and by Halloween you'll feel like a true Frankenstein monster, patched together from broken and discarded pieces as your heart and head collide and leave you unable to speak in coherent sentences. Your dreams turn into nightmares this Halloween weekend, Pisces, as you expect too much and receive too little. What is happening?! Is this real?! You're edgy and confused through Sunday, when the Capricorn Moon breaks into your nightmare realm like Freddy Kruger, only to laugh menacingly at your inability to find balance. On Halloween, your nightmares will finally begin to subside, but that doesn't mean you'll be able to sleep.